Are you seeing the results you would like on LinkedIn? Do you wish your profile could do more for you? Today I’m going to provide you with tips on how to build the perfect LinkedIn profile to help improve your chances of standing out. When people talk about different social networks they are on, they often mention Facebook and Twitter but not LinkedIn. This is most likely because LinkedIn is often considered to be a digital rolodex and not a true social network. While we connect with friends and people we meet at conferences on Facebook and Twitter. On LinkedIn, some people limit their connections to just work colleagues and recruiters. This is not the best practice because when you do this you limit the opportunities you have to grow on LinkedIn. Don’t get me wrong, it is definitely important to look at each invitation you receive to connect to make sure you are not adding people you don’t share any interests with. But if you want to build a presence, you need to be connecting with other LinkedIn profiles. So why is having a LinkedIn profile necessary? The average LinkedIn user spends just 17 minutes per month on LinkedIn . This doesn’t seem like a lot of time, but you have to look at the type of people you are connecting with. LinkedIn is primarily made up of business-minded associates who have limited time. Therefore, you are not going to see many people posting family photos or sharing more personal details. Instead, you can expect to see posts that are sharply written updates and focus on sharing articles and blog posts related to their professional background and qualifications. So how do you compete for such a limited amount of time on LinkedIn? This is where having the perfect LinkedIn profile can help. Here are just a few of the benefits when you have a great looking profile. When building the perfect LinkedIn profile, be sure you are using the correct social media dimensions. This way your profile looks its best and it gets seen more. Besides these benefits to having a great LinkedIn profile, which areas of your LinkedIn profile should you be focusing on if you want your LinkedIn profile to get more attention both in search and in recommendations to other users? This infographic from Link Humans covers each area of your LinkedIn profile to help you build a perfect profile! Do you maintain a LinkedIn Company Page for your business? Did you know you can extend your company page to spotlight your brand, or products using LinkedIn Showcase Pages. Because this page represents a piece of your business, you want to make sure when you are setting up your LinkedIn Showcase Pages, you size your images properly. This way your brand or products will look their best to people who are following them. Example of a LinkedIn Company Page with LinkedIn Showcase Pages. One thing you will notice, LinkedIn Showcase Pages look very similar to Facebook Pages. Unfortunately, the image dimensions are not the same. Example of a LinkedIn Showcase Page. Learn which image sizes you need for your LinkedIn Showcase Pages with this handy infographic. If you find this infographic on LinkedIn Showcase Pages image dimensions helpful, be sure to pin it on Pinterest by hovering over each image. If you like, you can also grab the embed code at the bottom to include this infographic on your own site as well. How much time do you think it takes to manage an effective social media strategy? If you said days or even weeks, you’re partially correct – if you run a social media agency. If you’re just managing your own social media accounts, you can do social media management in just 60 minutes a day! 60 minutes a day on social media? Really? It can be done. 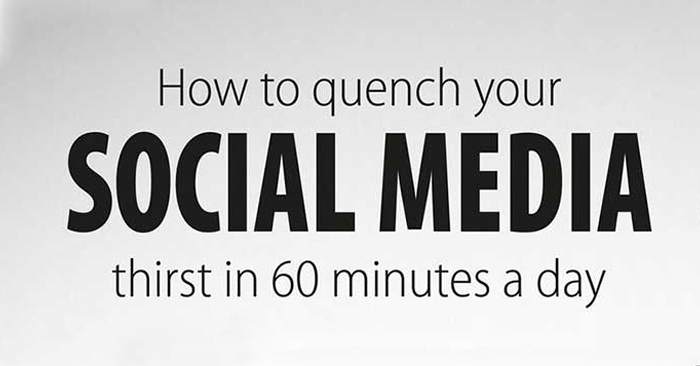 Learning how to manage your social media accounts in just 60 minutes a day takes discipline. It also means you need to focus on what your goals are when you logon to a site. We’re all guilty (myself included) of going on Facebook for one thing and then spending hours just browsing. This plan assumes that you already have a social media strategy in place. What you are learning about is how to split up your time spent on social media activities in 60 minutes per day. This way you can use that time towards being productive in other areas. Social Media recruiting – is it working? It used to be that job recruiting over social media didn’t work. Today, a lot has changed and social media recruiting is hotter than ever. In fact, 92% of companies use social media for recruiting (tweet this). Let’s explore some stats that support the claim that social media recruiting works. While these numbers suggest that companies are benefiting from using social media to become more efficient with in their recruiting efforts and to help improve the quality of applicants for a job, does this actually lead to more jobs for job seekers? Let’s find out. Does social media recruiting lead to more hires? Continue reading Social Media recruiting – is it working? Manager’s Choice is a great tool for LinkedIn Group owners to use to feature and highlight specific content to their group members. Learn how to change managers choice on LinkedIn Groups in just a few steps. Before you begin changing manager’s choice on your LinkedIn Group posts though, it’s important to know that not all posts can be set for managers choice. Here is an example of two types of posts made in LinkedIn Groups. Notice that one is bold and the other is not. Posts that are in bold can be set to managers choice. Posts that are not in bold cannot be set for managers choice and only link off to the website link provided. Follow these instructions on how to change managers choice on your LinkedIn Group posts. Have you ever received the following message when you tried to join a group on LinkedIn? While the instructions are not very clear on what you need to do next, the answer is simple. It’s time to leave a LinkedIn group. For those of you who are not aware, there is a limit on how many LinkedIn groups you can join. It’s 50. You can join 50 LinkedIn groups and 50 LinkedIn sub-groups. While I’m not sure who selected 50 as the limit on LinkedIn groups, once you’ve reached this threshold, the only way you can join any more groups is to either withdraw a request to join a LinkedIn group or leave a LinkedIn group. This is where things can get frustrating because at no point on this error page does LinkedIn tell you what that number is or even how to fix the issue. Having encountered this situation previously, I thought I would share instructions on how to leave a LinkedIn group so that you can spend your time joining more groups and less time looking for instructions on how to fix your issue. One of the biggest challenges to using any social network is finding help. In most cases, it’s easier to use their product, but when something goes wrong, there’s no one around and you’re left to find a solution on your own. We’ve compiled a list of the best way’s to contact LinkedIn for those times when you need help with an issue. If you’re looking to add your company to LinkedIn by building a LinkedIn company page, you want to make sure you have the right LinkedIn dimensions. LinkedIn dimensions are importabt because when you want to build a LinkedIn company page, they can help you decide which items you want to feature and where they best fit. Before you get started building your company page, be sure you know the right LinkedIn dimensions. We’re talking about the size of your company logo, cover photos, the careers page and most importantly, products and services. To help you out, I’ve created an infographic with all of the LinkedIn dimensions that you’ll need to build a LinkedIn company page that not only looks great, but also helps you decide which images will help your content stand out to followers. 2012 was the year of social media. Facebook, Twitter, LinkedIn, Instagram and Pinterest all experienced tremendous growth in social media. So how can you as a business, capitalize on the success of these growing social networks in 2013? First, you need a social media plan. No, you don’t have to get your calendar out and start feverishly writing. Instead, there’s a handy infographic that can help you figure out what you need to be doing each month to reach social media success in 2013.